The fight which just might end up being the biggest-money, most-watched pay-per-view event of all-time is behind us. 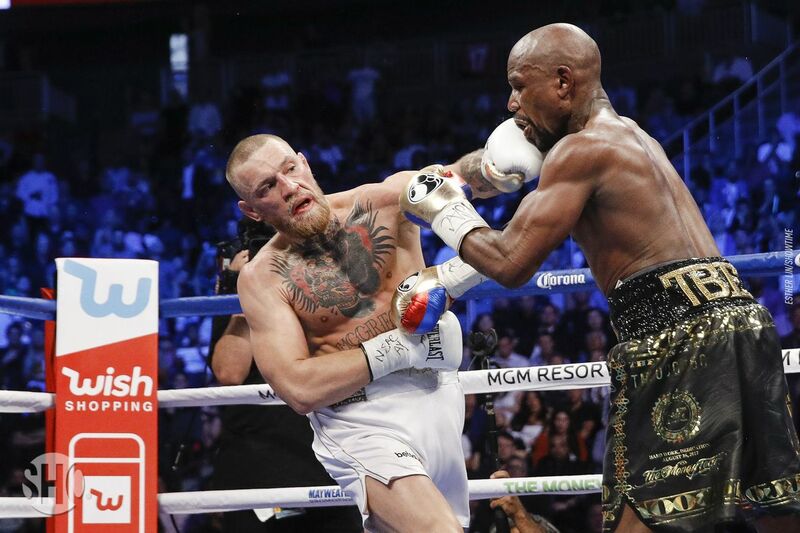 Needless to say, we’ll talk about the ramifications of Floyd Mayweather Jr.’s 10th-round TKO of Conor McGregor and also start the shift back toward MMA business as usual in the latest edition of Fightweets. @ThomasTheorema: Lot of talk and call outs, but will more MMA fighters go over to boxing? If so, who are some of the more likely fighters to do so? Good god, let’s please put a stop to this. MayMac was as big of a deal as it was because a once-in-a-generation event. The fight in Las Vegas featured the biggest stars of their generations in boxing and mixed martial arts clashing, with the former competitor undefeated and coming out of retirement and the latter taking his boldest step in a career full of brash moves. So the fight went down and ended up being far more entertaining than most honest people will tell you they expected it to be. Then, this week, the “me, too” bandwagon filled in rapid order. Jose Aldo proclaimed he wants to box (I swear, if Conor McGregor announced he wanted to adopt a puppy, Aldo would declare two months later that he, too, wanted a dog). Former boxing champ Andre Berto likewise said he wanted to compete in MMA (in his case, at least, he can lean on brother Edson Berto, a veteran of nearly 30 MMA bouts). By midweek, fighters declaring they wanted to make the jump, regardless of which side, started to come off like that dude who shows up to the party after most of the guests have already left and most of those remaining have already passed out. The UFC relented on allowing Conor to box because they wanted to keep their biggest star happy, and because there was so much money to make in this one specific instance that it would be foolish to get in the way. The boxing side did the promotional heavy lifting. The UFC essentially just had to show up and collect their cut, a number which will be as big as any PPV they’ve ever done. Minus someone with Mayweather’s star power as the A-side,, that’s not happening with Jose Aldo. Or Stipe Miocic, who hasn’t yet proven himself an A-list draw in MMA, never mind another sport. The UFC has enough of a task on its hand creating new stars without letting everyone who sniffs a payday wander off to compete in boxing. @ndeward: Do you think Conor will ever return to 145? I mean, never say never. Conor’s going to go where the biggest challenges for the most money lie. Featherweight champion Max Holloway would fit the first half of that bill. McGregor vs. Holloway would be one hellacious scrap. But Holloway’s not going to make McGregor anywhere near the paycheck a Nate Diaz trilogy fight will, much less a Mayweather-level payday. And that doesn’t even take into account McGregor looking horrible the past couple times he had to make the cut down to 145. He’s not putting himself through that again unless he absolutely has to or if a featherweight fight is his biggest-money option, and neither of those will be the case any time soon. (As for the related “Who should Conor fight next?” to me, the Diaz trilogy fight is the answer). @ohmar762: Do you think Conor showed the blueprint to defeat him in fighting Floyd by gassing out thus leading to fighters being patient with him now? McGregor certainly did his part in amplifying this idea by admitting in his post-fight interviews that he gets fatigued after fast starts. But I’m not convinced that we didn’t learn anything we didn’t already know. McGregor’s already run into trouble by round two against Chad Mendes and in both Diaz fights. Last weekend, McGregor was boxing against one of the greatest human cardio machines in the history of sports. Nothing in an MMA fight is going to replicate going into the late rounds of a boxing match with Mayweather. You’d think, given what we already know, that mixed martial arts opponents would be more likely to try to wrestle with McGregor from the outset and wear him down rather than stand and bang with him and hope to ride out the storm until he tires (the latter of which did work for Diaz in his first McGregor fight), but then, if it was that easy, someone would have successfully implemented that game plan now, no? @hunt5588: I really enjoyed the spectacle of MayMac….does that make me a bad MMA fan? Heck no. I’ve been doing this for 11 years, and last week was as fun as any I’ve had along the way. In hindsight, it’s obvious that in the buildup to the fight that we in the MMA world seemed to be the only party even remotely excited about the fight, and even that came with a ton of reservations. Meanwhile, the boxing media did their best “Muppets old guys in the balcony” meets “Grandpa Simpson yells at a cloud” routine in dismissing the fight out of hand; and mainstream sports columnists basically bored us to tears with the usual handwringing about how this means the apocalypse is upon us and won’t anyone think about the purity of sport and the future of children and blah blah blah. But guilty pleasures are some of life’s greatest, and on MayMac, we’re guilty as charged. MayMac was big, bold, audacious, and delivered. Here’s a crazy thought: Maybe every once in awhile we should just enjoy the ride? So no, unless you came out of that fight convinced that Ronda Rousey should fight Mayweather next, you’re not a bad MMA fan. @MacPherson9999: is it concerning that they couldn’t book a “real” main event for UFC 216, or just a scheduling anomaly? So, these questions seem the two sides to a coin, and a fine, rare, totally under-appreciated coin, at that. In terms of whether or not the UFC 216 main event for the interim lightweight title is “a real main event,” guess what? UFC is going to have to start creating new main eventers sooner rather than later. You know the drill by now: Rousey’s probably done, who knows when McGregor will be back, and for all we know, Jones could be out up to four years, pending his USADA case. The “middle class” of pay-per-view draws, those who could be counted on to bring in a half-million buys a few times a year in between the biggest shows, has basically been decimated. And Ferguson vs. Lee is as a good a starting point as any to see how WME does at this game. Right now, UFC 216 doesn’t figure to be one of the bigger-drawing UFC events of the year, which is a shame, because it should be a killer fight. But will WME be able to get Ferguson and Lee mainstream attention going in to help build the show? And if it’s a great fight, or if one of the two puts in a great performance, will they be able to build them further from here? Because in this fight, you’ve got one of the most dynamic fighters in all of the sport in Ferguson, a dude who happens to be just crazy enough to be a star in an offbeat way. And in Lee you’ve got a character with the charisma to be a potential superstar, so long as he’s able to hold up his end of the bargain now that he’s going against the elite tier of competition in the cage. So, don’t worry so much about what the numbers are on UFC 216. They’re not going to be great. Think instead about the winner, and how well they are able to build him from this point on. If the Ferguson-Lee victor is capable of drawing solid numbers (without the help of some guy named Conor) three more fights down the road, then we’ll have an indication WME knows how to build a fighter. @Jowi1046: Do you think Francis Ngannou has the potential to beat Stipe Miocic? Sure. Anyone with Francis Ngannou’s power has the ability to knock anyone else out. The question is, do you really want to rush him into a title fight this fast? We finally seem to have a legitimate fresh contender at 265, so giving him a couple more fights to build his resume, continue learning his craft, and giving him more time to build his name with the fans would same the prudent course.